This was our second year of doing an after-hours Friday evening camp-out at the library. 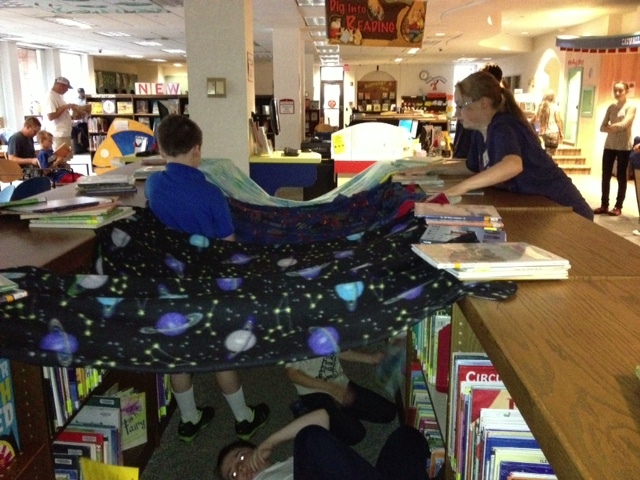 About a half hour after the library closes at 6pm, we re-open for kids and families who are ready to read and camp. Campers are invited to bring sheets or blankets and a flashlight. Everyone enters the children's area where the lights are off (but since it's summer we have plenty of natural light). Teen volunteers have cleared the tops of shelves and pulled chairs out from tables to create maximum scaffolding to create cozy tents and reading nooks. As families come in we invite them to create a tent and read for 20 minutes or so. We have extra sheets and blankets for those who come without (note to self: next year have some extra flashlights in hand). The tents kids and parents come up with are nothing short of delightful - I mean talk about the "E" in STEM. 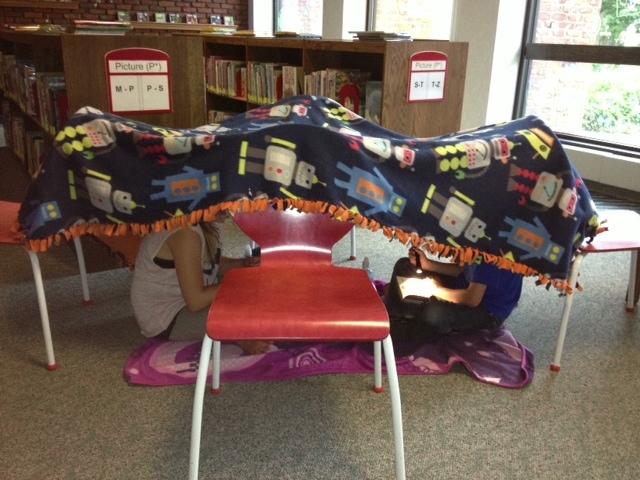 Thoughtful engineering goes into each reading nook created with blankets and book anchors. After about twenty minutes we gather everyone together for a program. Last year we did spooky stories. This year, with our Dig into Reading theme we had another idea! While colleague Sara Bryce was at a NASA-sponsored workshop the previous year at UW-Madison, she had learned about a loan program from the UW Geology Museum. Need some interesting rocks or geodes? Why, you can check them out for six months! We had a collection of geodes from near (IA) and far (Madagascar) that we had on "no-touch" display for a month. Now was the time to unlock the case and get up close and personal with these crystalline wonders. When kids entered the program room, there were geodes everywhere. Sara did a fascinating presentation using styrofoam bowls and food coloring to show how geodes form and booktalked a book on dragons (geodes and dragon eggs). Then kids and families got to touch and examine the geodes. We gathered them again, handed out Tootsie Pops (how more geode-like could a treat be?) and I shared a story next to our fake camp-fire. 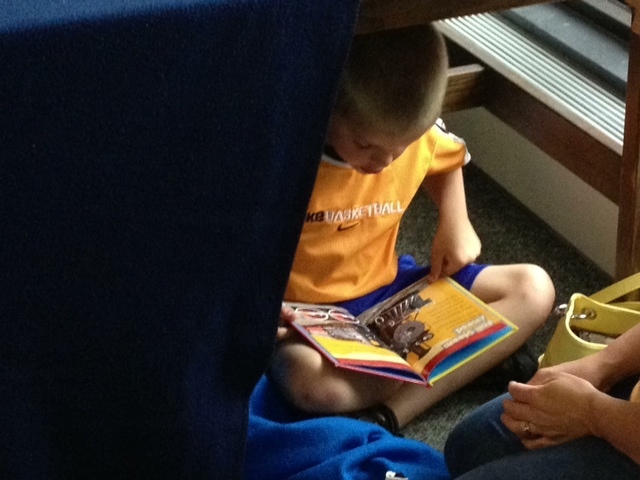 Camp-outs are a great way to create an "exclusive" feeling program where families get the library to themselves. With minimal preparation and kid-led activities (unprogramming!! ), everyone comes away feeling great. Well-worth it!